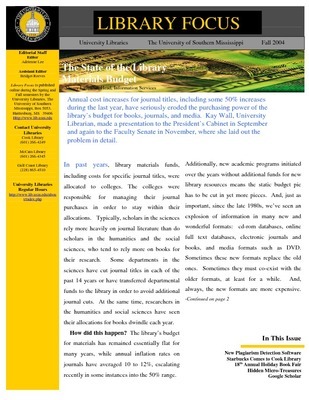 Library Focus, the newsletter of University Libraries, is published twice a year during the spring and fall semester. 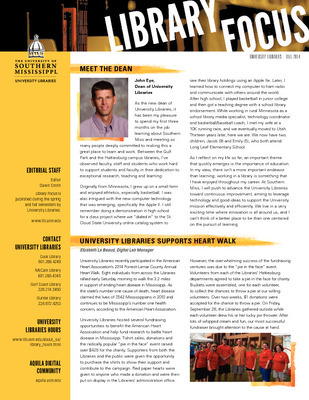 Library Focus highlights the collections, services, events and activities at the libraries of the Hattiesburg and Gulf Coast campuses. 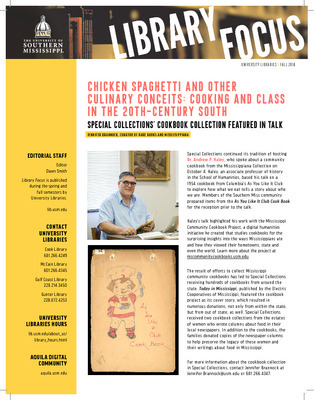 The fall 2018 issue of Library Focus features highlights from University Libraries’ Special Collections, including the annual cookbook event, materials processed in 2018 and outstanding student employees. 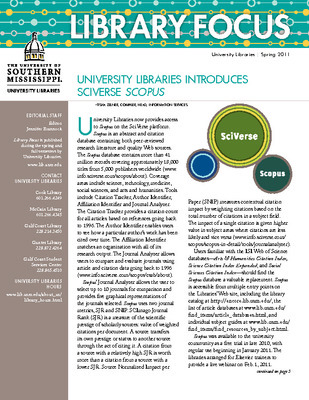 Also in this issue are the collections exhibited at the Gulf Coast Library, the fall series of Science Café and three new librarians that joined the team this year. 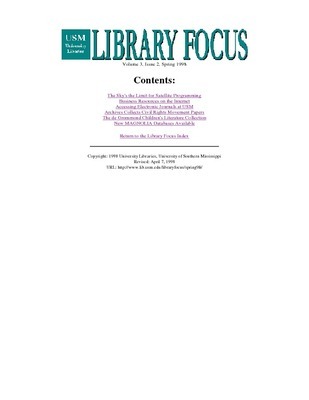 The spring 2018 issue of Library Focus, the newsletter of University Libraries, highlights the 2018 Ezra Jack Keats Book Award and the Fay B. Kaigler Children’s Book Festival. 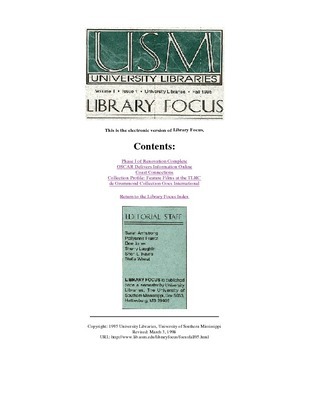 This issue also includes the 2018 Edible Book Festival, Gulf Coast art exhibits, and the updates made to University Libraries’ web site and Digital Collections’ new public interface. 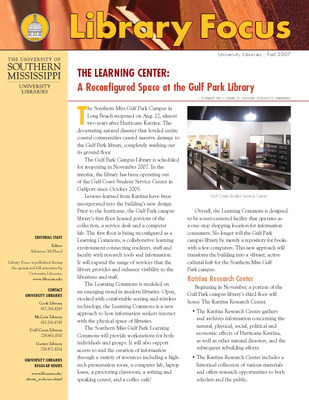 Additionally, this issue highlights new study space in the Gulf Coast Library. 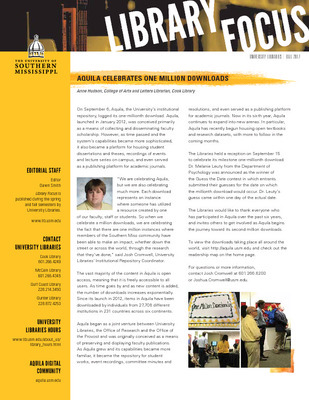 The fall 2017 issue of Library Focus, the newsletter of University Libraries, spotlights Aquila’s milestone one-millionth download. 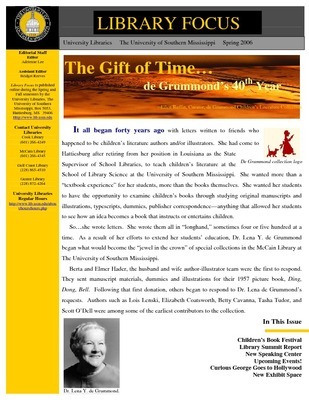 Additionally, the issue features the Mississippi Library Association annual conference held in Hattiesburg, events planned in celebration of Mississippi’s bicentennial and several items from special collections, including the student curated exhibits. 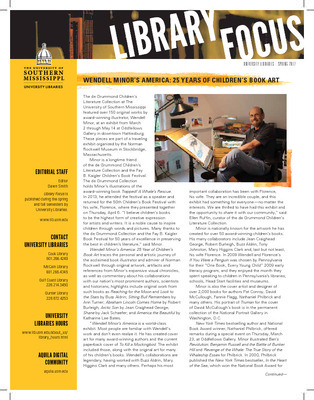 The spring 2017 issue of Library Focus, the newsletter of University Libraries, features the events surrounding the exhibit Wendell Minor’s America: 25 Years of Children’s Book Art and the 50th Fay B. Kaigler Children’s Book Festival. 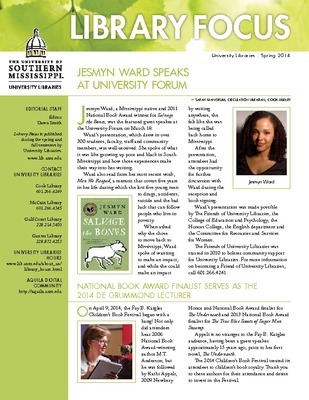 This issue also highlights University LIbraries’ events celebrating Mississippi’s Bicentennial, the Ezra Jack Keats Book Award, Science Café on the Coast and much more. 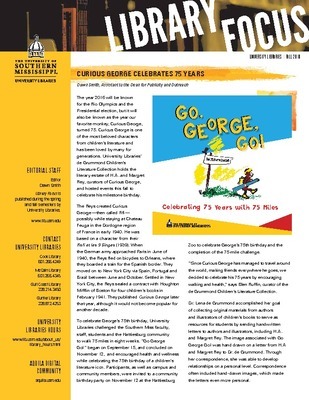 The fall 2016 issue of Library Focus, the newsletter of University Libraries, features the events surrounding the 75th birthday of Curious George and the documentary telling the story of the Curious George creators, H.A and Margret Rey. 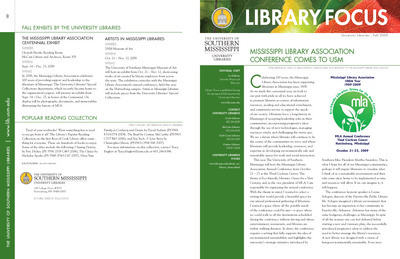 This issue also highlights University LIbraries’ participation in the Mississippi Library Association’s annual conference, and events and exhibits supported by University Libraries Special Collections. 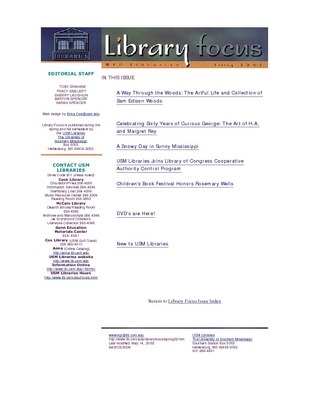 The spring 2016 issue of Library Focus, the newsletter of University Libraries, includes articles highlighting the Children’s Book Festival as well as the Ezra Jack Keats Book Award, the national award given to new writers and illustrators each year during the Children’s Book Festival. 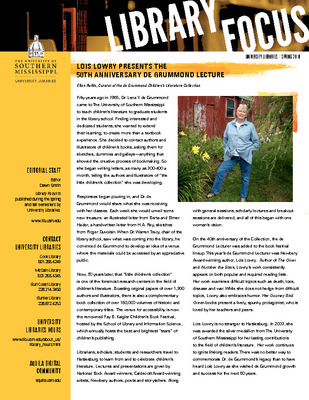 This issue also highlights the de Grummond’s 50th Anniversary, Science Café’ on the Coast and at Cook Library, the Friends of University Libraries, the Gulf Coast faculty/staff art exhibit, the 16mm Film Festival and the Edible Book Festival. 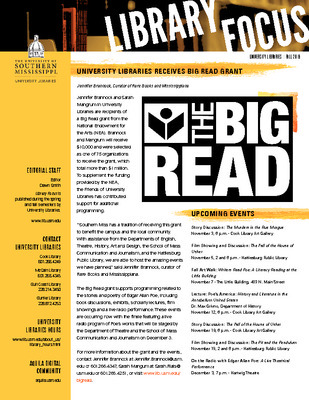 The fall 2016 issue of Library Focus, the newsletter of University Libraries, includes articles highlighting the Big Read events as well as the Tasha Tudor: Around the Year exhibit currently on display at Oddfellows Gallery. 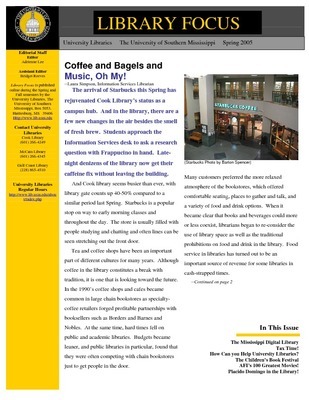 This issue also features the updates from the Gulf Coast and Gunter Libraries, including art exhibits and Welcome Week activities. 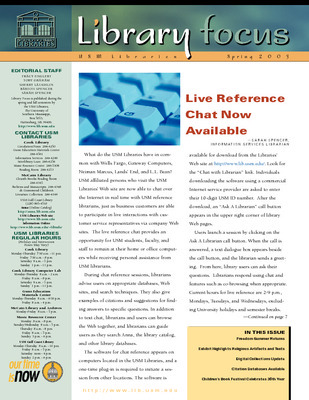 Additionally, reports from IR Day, new collections and exhibits, and the new printing system can be found in this issue. 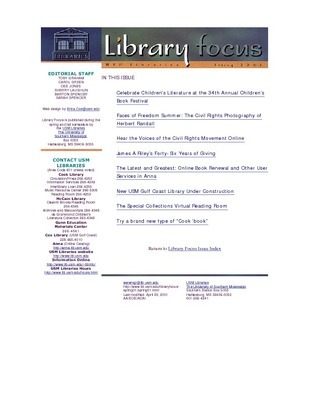 The spring 2015 issue of Library Focus, the newsletter of University Libraries, includes articles recapping the Children’s Book Festival as well as the Ezra Jack Keats Book Award, which is hosted by the de Grummond Children’s Literature Collection and the Ezra Jack Keats Foundation. 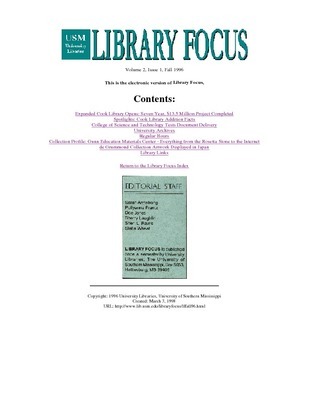 This issue also features the digitization/preservation grant from the National Endowment for the Humanities to preserve and provide access to civil rights oral histories as well as the Rosemary Wells art exhibit and other exhibits hosted by University Libraries. 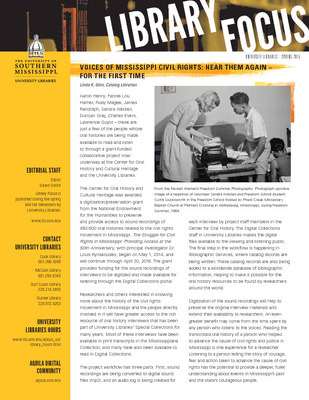 The fall 2014 issue of Library Focus, the newsletter of University Libraries, includes articles recapping the the Created Equal Talks, the Mississippi Community Cookbook Project event, the fall Science Café, Digi Day, Heart Walk and exhibits in the Library’s galleries, such as the Freedom Summer exhibit. 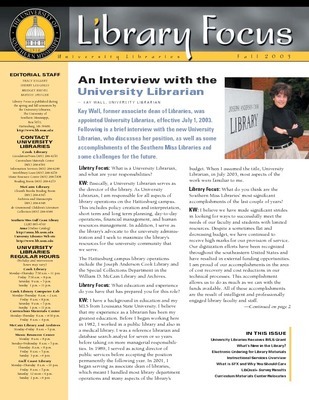 The issue also introduces the new Dean of University Libraries, Dr. John Eye. The Spotlight On…article features new librarians Xiaojie Duan, Michele Frasier-Robinson and Elena Azadbakht. 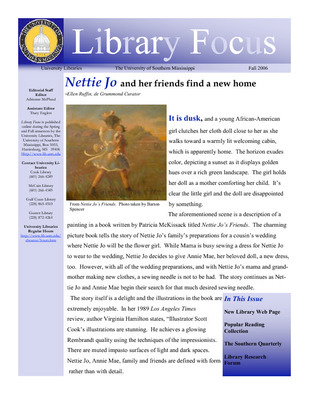 The spring 2014 issue of Library Focus, the newsletter of University Libraries, includes articles recapping the 47th Annual Fay B. Kaigler Children’s Book Festival; the Ezra Jack Keats Book Awards; the University Forum featuring Jesmyn Ward; the Dancing with the Deans event; Nano Days; Recycle Mania; and exhibits in the special collections, such as the art of pop-up books and the romance book exhibit. 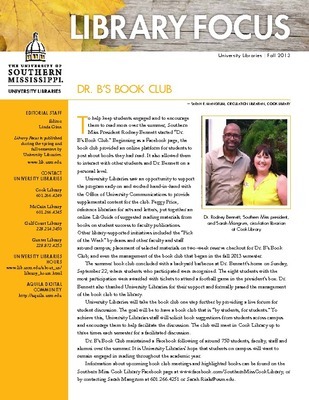 The Spotlight On…article features Maryanne Anthony, library assistant at Gunter Library. 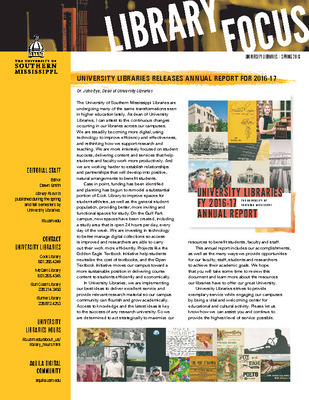 The fall 2013 issue of Library Focus, the newsletter of University Libraries, includes articles on Dr. B's Book Club; the Civil War 150 Lecture Series; Science Cafes at Cook Library; a showcase of local artists at the Gulf Coast Library; Bridging Cultures Bookshelf: Muslim Journeys; University Libraries on Facebook and Twitter; Chat Reference at Cook and Gulf Coast Libraries; Jennifer Brannock selected for the Mississippi Library Leadership Institute; and much more. The Spotlight on… article features Stephen Haller, Curator of Historical Manuscripts and Archives. 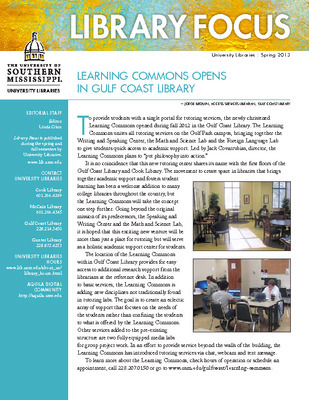 The spring 2013 issue of Library Focus, the newsletter of University Libraries, includes articles on the new Learning Commons at Gulf Coast Library; expanded library services for both campuses, including e-books; LibGuides, the research guides for students and faculty; announcement of this year’s Keats Book Awards for new authors and illustrators of children’s books; Mississippi Digital Library; Gulf Coast artist and Southern Miss graduate Linda Lang Ishee; and the 40th Children’s Literature Association conference to be held in Biloxi in June. The Spotlight on… article features Jorge Brown, Access Services Librarian at Gulf Coast Library. 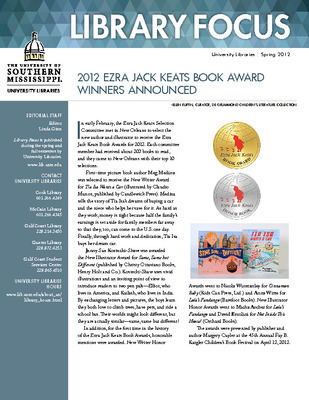 The spring 2012 issue of Library Focus, the newsletter of University Libraries, includes articles featuring the 2012 Ezra Jack Keats Award winners; an exhibit featuring author E.B. Lewis, held at the Historic Hattiesburg Train Depot; showcases on newly licensed electronic resources; the "Dancing With the Deans" competition; new additions to the Gulf Coast and McCain Libraries; a reception hosted by the Friends of University Libraries honoring author Jonathan O'Dell; DeGrummond lecturer, Margery Cuyler; and the traveling exhibition In a Nutshell: The Worlds of Maurice Sendak. 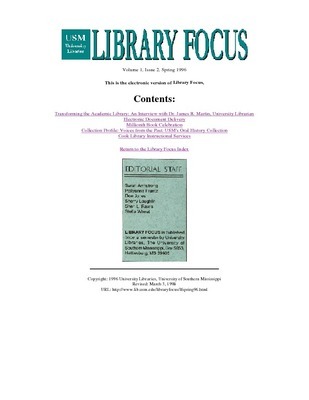 The Spring 2011 issue of Library Focus, the newsletter of University Libraries, includes articles featuring new access to the Scopus database; the 44th Annual Fay B. Kaigler Children’s Book Festival; the new foreign language lab at the Gulf Coast Library; the 75th Anniversary of the Federal Depository Library Program; an obituary for Head of Library Technology, Barton Spencer; the return of the Science Café; and Elayne Lockett’s Staff Council Service Award. 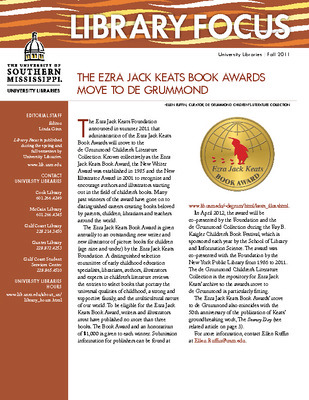 This issue also features exhibits showcasing Mississippi authors Tennesse Williams and Con Sellers; a series of photographs of daily life in Baghdad; and the Society of Children’s Book Writers and Illustrators award winners. 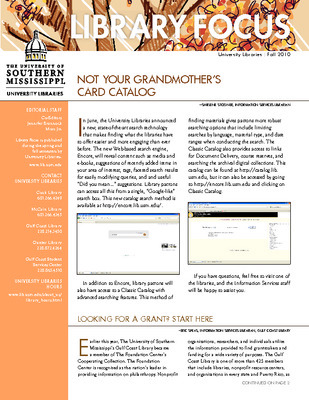 The Fall 2010 issue of Library Focus, the newsletter of University Libraries, includes articles featuring a new search engine for patrons; the Gulf Coast Library's membership with the The Foundation Center; a series of Science Café meetings; a donation from the Nippon Foundation; new additions to Cook and Gulf Coast Libraries; the 2010 Fall Book Preview; the Katrina Research Center's Fashion Show; and summer activities in the Curriculum Materials Center. 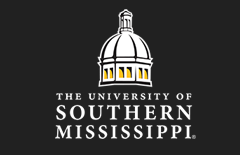 It also showcases exhibits featuring: the history of football at Southern Miss, Taiwan, and the works of Margaret and H.A. Rey. 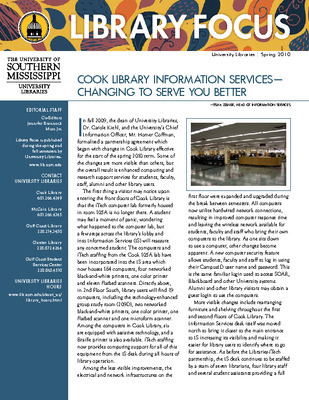 The Spring 2010 issue of Library Focus, the newsletter of University Libraries, includes articles featuring changes to Cook Library’s Information Services; the 43rd annual Fay B. Kaigler Children’s Book Festival; new hours for the Gunter Library; a large collection of research materials donated by Dr. Antonio Rodriguez-Buckingham; the Waller Photograph Collection; and de Grummond lecturer, Richard Peck. 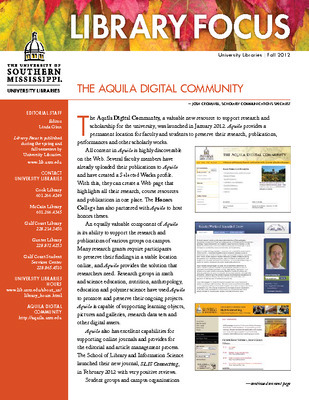 This issue also showcases exhibits featuring fairy tales and folklore; the Southern Miss centennial; media tie-ins; and immigration. 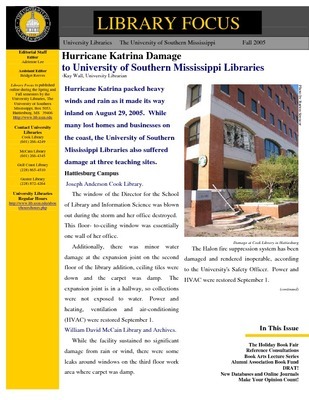 The Fall 2009 issue of Library Focus, the newsletter of University Libraries, includes articles featuring the Mississippi Library Association Conference hosted at USM; the Fall Children’s Book Preview; a collection of memorabilia from the Gulf Park College for Women; a conference about the cultural and material history of fairy tales; the Curriculum Material Center’s Summer Reading Program; the Scholastic Book Fair; changes to the Digital Collections web site; an Institute of Museums and Library Services grant awarded to the University Libraries; the de Grummond collection’s acquisition of the Children’s Literature Association Award archives; new resources in Cook Library; and the Katrina Research Center. 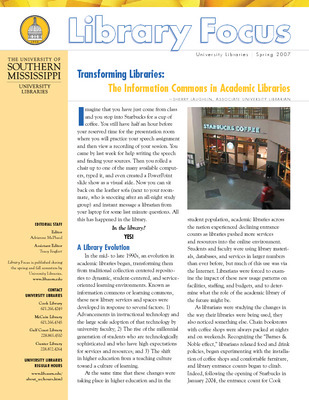 The Spring 2009 issue of Library Focus, the newsletter of University Libraries, includes articles featuring a talk by author Louise Borden; Judy Blume’s Southern Miss Medallion award; a special celebration in honor of the late Coleen Salley; USM librarians elected to national and state positions; new resources in University Libraries; a film showing for Women’s History Month; a Gunter Library display celebrating Dr. Gordon Gunter; the Fall Book Preview. 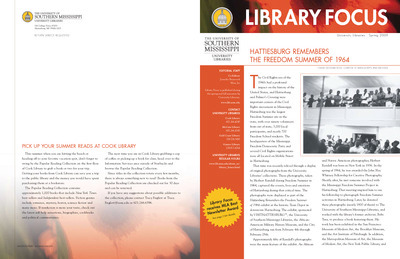 This issue features exhibits showcasing the Freedom Summer of 1964 and a Special Collections exhibit called Long Ago and Far Away. 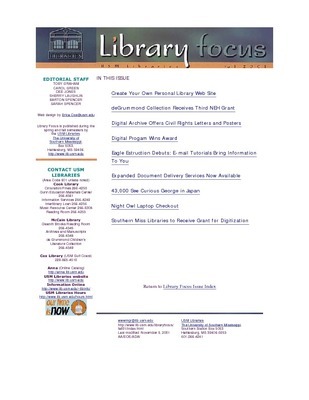 Library Focus was the 2008 recipient of the Mississippi Library Association’s Public Relations Award for Best Newsletter. 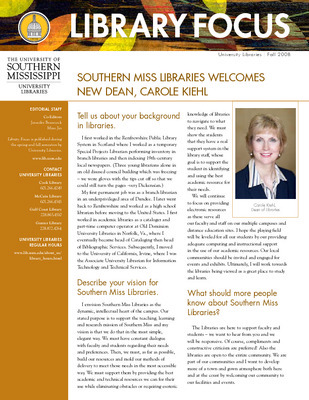 The Fall 2008 issue of Library Focus, the newsletter of University Libraries, includes articles featuring new Dean of Libraries, Carole Kiehl; Head of Bibliographic Services Ann Branton’s election as Vice President of the Mississippi Library Assoication; new furniture at the Gunter Library; the University Libraries’ Speaker series; the Children’s Book Preview; the 42nd Annual Fay B. Kaigler Children’s Book Festival. 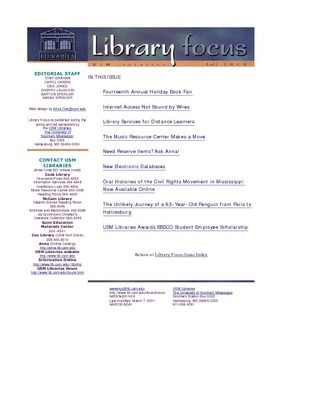 The issue also features new such electronic resources such as podcasts, a new Digital Collections interface, and a new web site for Special Collections. 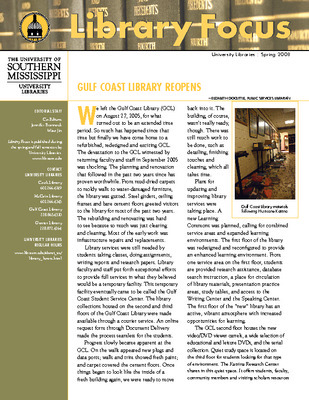 The Fall 2007 issue of Library Focus, the newsletter of University Libraries, includes articles featuring renovations to the Gulf Park Library; new electronic resources; Southern Miss Honors Forum speaker, author Deborah Wiles; the dean of University Libraries search committee; a University Libraries lecture series; results of a LibQual+ User Survey; and the Popular Reading Collection. 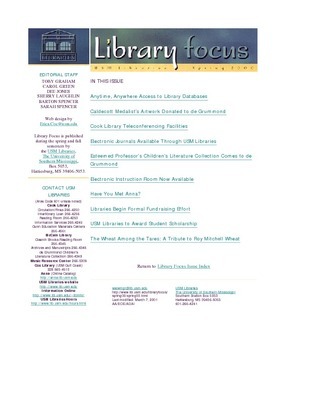 The Spring 2007 issue of Library Focus, the newsletter of University Libraries, includes articles featuring the Information Commons at Cook Library; changes to electronic resources; post-Hurricane Katrina recovery plans for the Gulf Coast Library and Media Center; the 40th annual Fay B. Kaigler Children’s Book Festival; the QEP Speaking Center; the Popular Reading Collection; and Katrina Grants received by University Libraries. 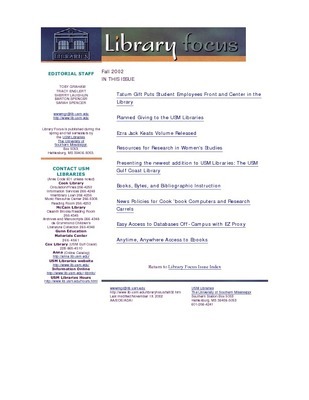 The Fall 2006 issue of Library Focus, the newsletter of University Libraries, includes articles featuring a collection of Scott Cook’s works donated to the de Grummond Collection; new services for faculty and staff; new popular reading materials; the first Library Research forum; and a new library web site and electronic resources.